Eden has a tendency to accidentally destroy the schools she attends. Whether it's through a flood or burning the entire building down odd things happen around her and she doesn't know what to do or how to control it. Kingsley Prep is her last option, the only school that has been willing to take her in so Eden is determined to graduate without any 'incidents'. Eden doesn't know that Kingsley isn't like other schools and the students aren't exactly normal, especially the other two new students that started the same day as her. 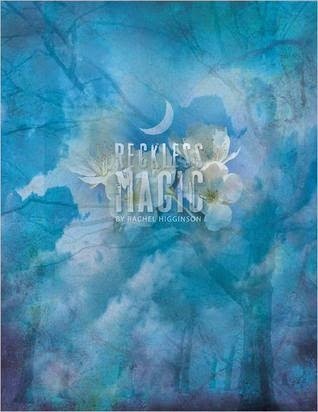 In Reckless Magic I could feel the chemistry and attraction between Eden and Kiran but I really did not like him. Kiran might be handsome but he was arrogant, stubborn, too cocky and yes I'm aware he is the crown Prince but he was so controlling and used to having his own way that it was rather off-putting. Eden, on the other hand, made me smile now and again with her rebellious and impulsive nature. Although all she wanted to do was be invisible at the school she managed to make herself the centre of attention a number of embarrassing times. However, I soon realised that Eden must be either incredibly stupid or in denial. In the story, she knows that somehow she has caused the problems at her previous schools, which led to her being expelled but she doesn't pick up that she has supernatural powers until it's spelled out to her. Talbott even refers to someone as a 'human' but she doesn't pick up on it being odd. I mean how dim can you be? Plus she wound me up when she couldn't push Kiran away even though she knew he had a fiance. I understand they had a magnetic attraction and even if the dude doesn't mind cheating that doesn't mean she needed to encourage it! She says she's not a home wrecker but her actions imply otherwise. From my review of the two main characters it sounds like I didn't enjoy the book, but I actually did. Despite not being overly fond of Kiran, Eden wasn't that bad once everyone explained things to her. The storyline was fun, filled with action and a number of bomb-dropping revelations scattered throughout the story, which kept it interesting. I'm not entirely sure whether I would continue reading this series our not but given the fact that I wanted to know what was going to happen next and whether Eden would actually save Lily out just cause more problems, I've given this book a 3.4 out of 5. The tests of the hospital all came back normal. I knew they would, I knew that whatever was wrong with me was not going to show up on a hospital chart or graph, unless maybe it was a mental hospital. I was sure that if he didn't have that damn accent I would have seen through him immediately. Oh, those Brits could be so charming and manipulative with their proper say of talking. "I am glad that you are feeling better." He assumed I was feeling better without even asking. I was not feeling better, I was feeling worse. It's quite difficult to get into a story when the protagonists don't float your boat. For the most part, I usually give a series a two book chance because the first installment often falls short because of world-building / character development. I agree in that I should give the start of a series more of a chance. But in all honesty, if I couldn't fall in love with a book after 349 pages, I doubt I'd pursue the series, but that's just me!